The first half of the concert will be “Lin at Blue” performed by Huang Yu-lin—the New Talent Award winner of the 25th Golden Melody Awards—and Seahorse Band. The program features a creative collage of female characters in Chinese opera, including Bai Su-zhen in The Legend of the White Snake, Yan Xi-jiao in Taken Alive, Mu Gui-ying in Yang’s Female Warriors, and Wang Zhao-jun in Zhao-jin Bidding Farewell over the Frontier. Moving between the roles of mother, wife, and lover, the performers will tell a story about the beauty and sadness of being a woman—the most complex creature in the world. 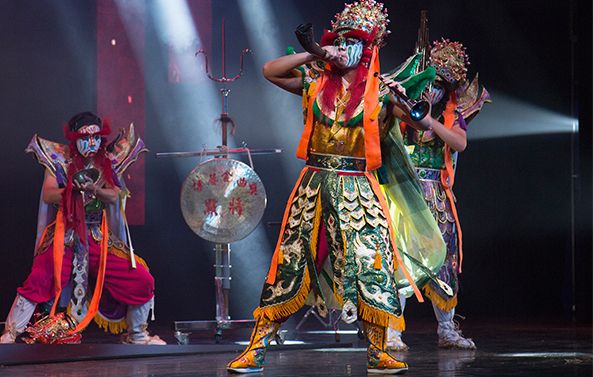 The second half will be featuring “The Roll Call,” in which several Chinese instrumentalists and Taiwanese exorcist performers (known as Eight General Gods) will present the works of Lu Yun, the awardee of the best composer in the 27th Golden Melody Awards. Her traditional yet creative Chinese wind music will take the audience on a journey of mystery and celebration. Copyright ©2016 National Center for Traditional Arts (Taiwan). All rights reserved.